You can find whatever you want at this place. Their staff so kind and helpful. Room facilities are really enough and new. You can choose that place easily if you wanna go to Brussels. Nice looking hostel, nice staff, nice looking bathroom, but in the evening there wasn't hot water. In the morning it was hot. No kitchen unfortunately, but a water kettle for some hot drinks and easy meals. Cutlery, cups, bowl and plates available. Big room to store luggage before check-inn and after check-out. 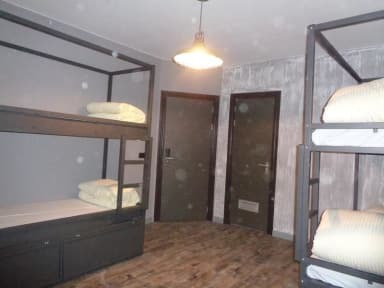 Close to Brussels midi train station and midi flixbus/ouibus pick up. Unfortunately I had a big snorer in the room and slept like s***t. For the rest spacious quiet room and hostel. My one suggestion is to do your homework before you come. It was a much farther walk from the train station that we had anticipated, especially carrying our luggage. The staff was mostly helpful, and the rooms were very clean, however the water pressure in the shower was very low. For the cost, it was definitely one of the better hostels I have stayed in. Really nice because it is so close to the Bruxelles-Midi train station which makes it easy if your train gets in late. 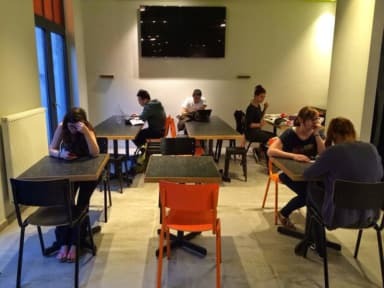 The rooms are reasonable, staff is friendly, no breakfast which is unfortunate as most hostels offer this. Wifi is good quality, beds are not the most comfortable and pillows are way to high. Overall though, it gets the job done! Not a very good experience, we had to ask for clean sheets four times before getting clean sheets and pillowcases. We’re not very happy with the customer service either, some of the staff was rude to my travel buddies when we asked for these clean sheets. The lobby smelled like sewage, and when we checked out and they said we could leave our bags they weren’t locked up or secure at all. Just a small room down a hallway. The rooms are not well structured and the wifi was really slow. I was leaving in a Room for 6 and all the cellphones were being charged on the way. Also there was alot of noise in the from the hallway. There are no elevators i had to carry my luggage to third floor. Do yourself a favor and just avoid this place. It's not in the best location and is poorly designed and cramped. It seems like everything is new, but is not kept up well. There's nowhere to put your belongings, no outlets, no lamps, bathrooms were disgusting. I only slept there 1 night and woke up to what the doctor confirmed were bed bug bites. I arrived at night so I did not see any signs of bugs but I had hundred of bumps. I emailed them to informed them, and after 2 weeks, zero response.